Welcome to another installment of If My Book, the Monkeybicycle feature in which authors shed light on their recently released books by comparing them to weird things. This week Allegra Hyde writes about her debut story collection, Of This New World, just published by University of Iowa Press. 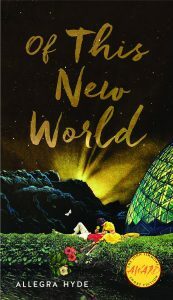 If Of This New World were a fruit-based dessert it would be an apple pie, deep-dish and juicy, gorged with cinnamon and the tart edge of Granny Smith and a little bit of woman sweat for good measure. If Of This New World were a tropical fish, it would be a Nassau grouper with an underbite and hermaphroditic tendencies. If Of This New World were an internationally significant waterway, it would be the Bosporus strait, slung between Europe and Asia like a silver bracelet, gleaming in the sunlight and studded with ships. If Of This New World were a friendship it would be hard to let go. If Of This New World were a tool it would be a long-handle round-point shovel, a little rusted around the edges. If Of This New World were a way of dancing, it would be the kind that bubbles up in you until you can’t hold it in—a dance that makes you writhe and tremble and lurch and spin—a dance born from the transcendent ecstasy of the utterly unknowable. If Of This New World were a flower, it would be purple bougainvillea. If Of This New World were a controlled substance, it would be a tab of LSD, neatly torn like a tiny postage stamp and placed on the pink flesh of an awaiting tongue. If Of This New World were an unsold item in a junk shop, it would be the oil painting of an elk standing on a forest ridge: objectively kitschy yet surreptitiously majestic. If Of This New World were a reason to leave, it would be the reason you don’t want to say, even to yourself. If Of This New World were a planet, it would be the red one, the big one, 4,222 miles in diameter, many-mooned and sun-dusted, eternally storming and staring back from the sky like the eye of a god you didn’t know you believed in. Allegra Hyde’s stories have appeared in The Missouri Review, New England Review, Alaska Quarterly Review, The Gettysburg Review, and The Pushcart Prize XL: Best of the Small Presses. She lives in Peterborough, New Hampshire. Find out more at allegrahyde.com or follow her on Twitter at @allegra_hyde.